Every night I seem to fall into the side dish pit of despair. There are only so many times you can make a pot of brown rice and steamed broccoli, or quinoa and a bowl of salad before your family starts giving you that, “You’ve got to be kidding me” look. When it comes to the entrees, I’ve got it down. Chicken, salmon or pork chops in the fridge? No problem! But by the time I reach the side dishes, any creative energies are depleted. So, I’m trying to come up with as many quick side dishes as I can to help with dinner prep. 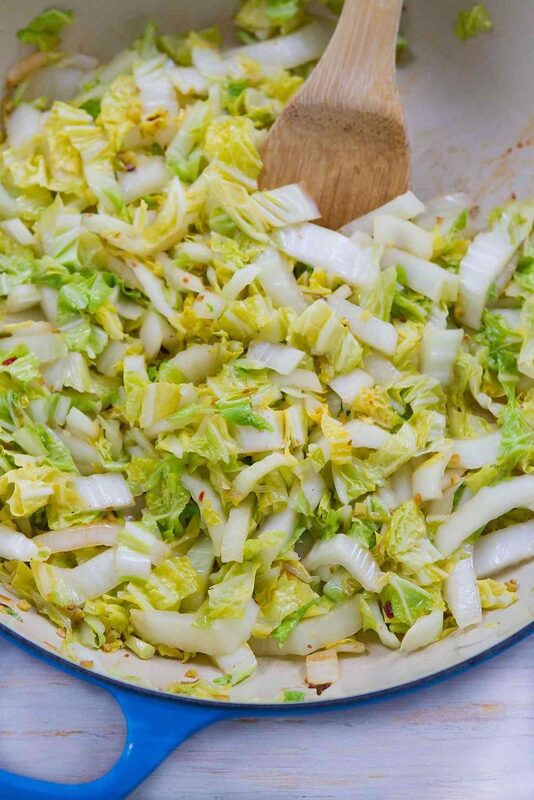 This 5-minute spicy stir-fried cabbage is a life saver when the side dish well runs dry. Napa cabbage is my go-to variety of cabbage and I use it in my favorite Thai Chicken Salad (I could eat the entire bowl!) and almost any slaw recipe. It has a finer texture and milder flavor than regular green or purple cabbages. It’s sold in most grocery stores, alongside the other cabbages in the fresh produce section. 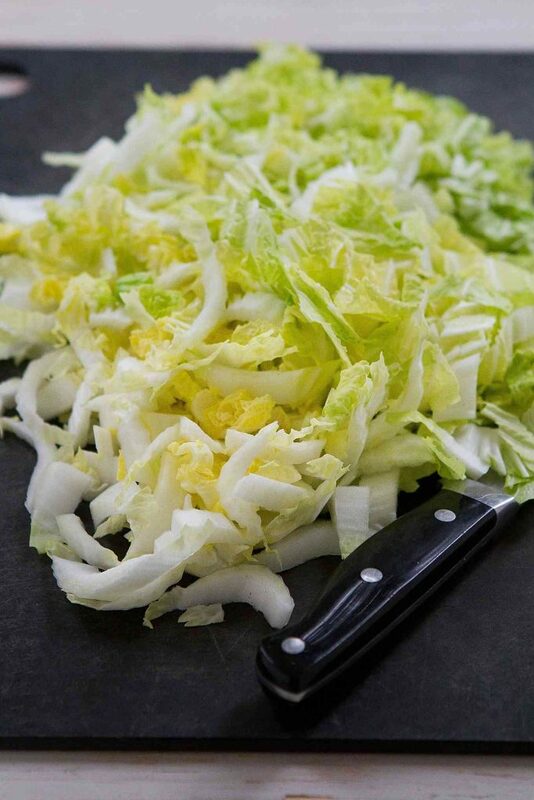 The sliced cabbage is sautéed in sesame oil with fresh ginger, then seasoned with a small scoop of chili garlic sauce (found in the international section of most grocery stores) and a drizzle of soy sauce. Simple, healthy and full of savory flavors. 1. Heat the oils in a large skillet set over medium-high heat. Add the ginger and cook, stirring, for 30 seconds. 2. 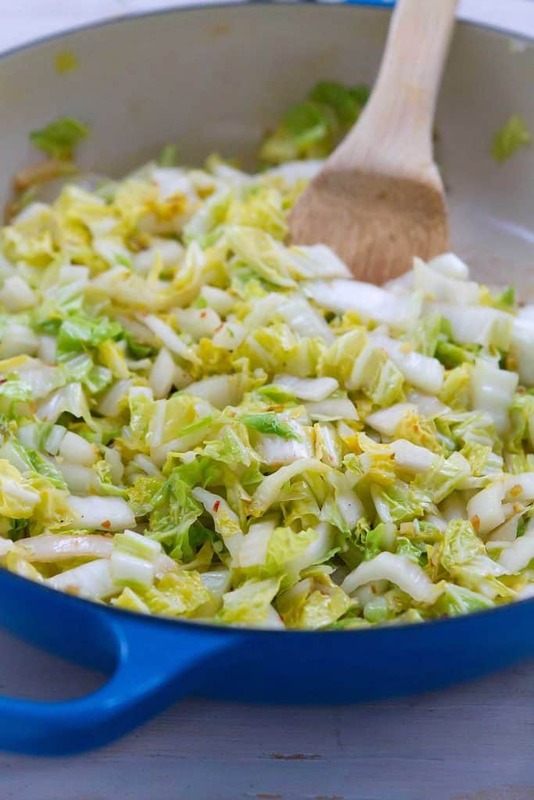 Stir in the cabbage and cook, stirring constantly, until the cabbage is just tender, about 2 minutes. 3. Stir in the chili garlic sauce and soy sauce (or tamari). Season to taste. Serve. Wow! Only 5 minutes? This is a great side dish! Thank you for sharing! I agree! AS long as I have meat thawed out dinner seems doable…it’s those side dishes that stump me! This would be so perfect with so many different main dishes….and so quick! I’m in the same boat when it comes to side dishes. I love that this is such a quick and easy option to get me out of my rut! I LOVE this side dish!! It looks and sounds SO delicious!! Spicy cabbage?! Gimme the whole pan! I’ve fried regular green and purple cabbage, but not Napa. Since I’m expanding my diet to include more leafy greens, I am eager to try your recipe. I plan on adding a grilled sausage link as a side dish to this cabbage main dish. So simple, yet delicious. Thank you for sharing.